Scadoxus Puniceus or ‘Paintbrush’ lily is a fascinating flowering bulb from South Africa where it grows in an area of summer rainfall. 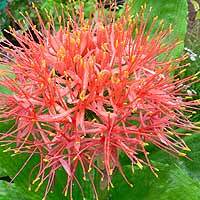 A little confusion exits here as the same bulb was originally classified as Haemanthus magnificus, however Scadoxus are now a separate group, so avoid confusion. Scadoxus Puniceus (picture right) flowers in spring with the trademark flower appearing on a stem around 40cm, the flower is long lasting and is followed by the foiliage which is more upright than the flat leaves of the Haemanthus group. They are available for sale in autumn when dormant. These bulbs are large once they reach full size and the key to successful cultivation is to keep them dry in winter and water them in summer, this mimics the natural growing conditions. They do require a sunny position but with some protection from the afternoon sun, a well drained soil is essential. Frost is s problem so provide some protection. Many gardeners grow these spectacular flowering plants in pots or containers but they do equally well in the garden and are generally easy to care for. Try growing them at the borders of a rock garden. Seeds can be collected when ripe and are fairly easy to propagate if you have the patience. We read a lot about growing these bulbs in full shade, part shade would be more accurate but they do need protection from hot sun. Remember to keep dry in winter, some growers turn their pots on the side to help with this. A weak liquid seaweed fertilizer applied in early spring to summer seems sufficient. The orange/red paintbrush flowers are held on long stems, foliage is a mid green. Scadoxus puniceus ‘Alba’ is a rarer white flowering species. Scadoxus puniceus ‘Magnificus’ and Scadoxus puniceus ‘Natalensis’, Scadoxus pole-evansii are others.